The inspiration behind our Station Posters Project was to brighten up Platform 1 for those waiting to board the London train at Crowborough Station. 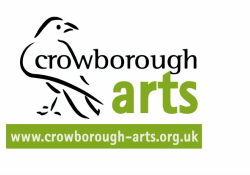 Each poster has been designed by a different Crowborough Arts member, and in the two years or so that they’ve been installed, we’ve had many compliments, confirming that they’ve achieved their purpose! One of the posters has received so much admiration that it’s been stolen, twice! Not really the sort of attention we would have preferred, but we have replaced the missing poster once again and invested in some much more heavy duty frames, which should prevent a recurrence. Do have a look at the posters, if you haven’t already. If you’d like to buy a set of postcards featuring the designs, they are available at 80p each, or £5 for the set of 7. We can also take orders for prints of the posters, and the charge for is £20 each for an A1 size and £18 for A2. If you’re interested in purchasing posters or postcards, please email or phone Mary Harris on 01892 653487. You can download an order form for Posters from here and for Postcards from here.